more + more, originally uploaded by ordinarymoment. :: To provide with food or other substances necessary for life and growth; feed. Our biggest harvest yet, though it may not seem that huge. Wishing my many green tomatoes red, discovering a softball size crimson beauty hiding in the middle. An orange + red striped heirloom, perhaps grown in the gardens of mamas + grandmas before mine were even born. 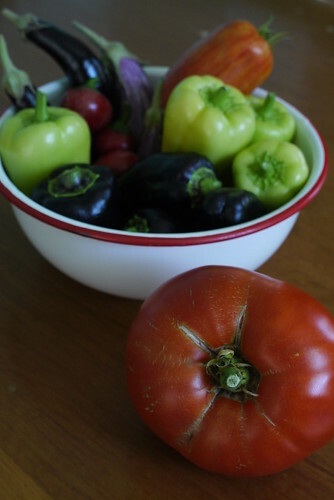 Crisp peppers of every color, long shiny eggplants, food for our soul. A vintage enamelware bowl, maybe even carried to another’s garden so long ago, for the fresh harvest. Hands into dirt, like those before us. Patient waiting, checking…finally picking. A labor of love becomes our dinner, to nourish and sustain, for whatever joys + challenges may lie ahead.